Here are the options for you to come and join us on the 12th September at the world famous Waterstones bookshop on Piccadilly, London from 6pm. Below is a breakdown of what you can expect from the updated, revised and expanded version of the second edition of my book Think #Digital First. As I’ve matured, my priorities have shifted. In my 20s I was passionate about life, and work; making mistakes along the way. In my 30s I tried to settle down, keeping my work and home life very separate. Now I’m in my 40s. I have the same passion for my work, but am married, with a beautiful baby girl, and merging work and family to give me the” lifestyle” I want. The second edition chapter one is all about understanding what makes a successful entrepreneur, and the importance of doing what you love. I share with you how doing what I love has bettered me as a business owner, and we give you an in-book worksheet so you can become the most successful you. What is the end goal for your business? Where do you and your business want to be in three years? Perhaps more importantly right now; where do you see your role in your business in the next 12 months? I asked myself that exact question when I wrote the first edition of this book, and everything I visualised and put on my vision board has come true, and actually turned out better than I could have imagined. The revised second chapter focuses on building a business plan, defining your business and truly understanding what your target audience wants from you as a business. Chapter two is a workbook that will help you define your marketing plan, brand style guide, strengths and weaknesses as a business owner and the type of entrepreneur you are. One thing I’ve learnt in last three years since first writing this book, and using this chapter as a mantra for everything I do on a daily, weekly or monthly basis, is the impact it’s had on my life. Making the decision to have a ‘lifestyle’ where my work and family are one and not a work/life balance, has meant that I’ve not only had to value my time (not to every 30 minutes but every 10 minutes) but also my organisation (me and my team) as well as my personal commitments. Something I’ve taken away from this is the knowledge of how my energy shifts throughout the day. The way I was working three years ago is very different to today. This chapter will share with you exactly how to manage your time effectively, so that you can focus on sales. When I first looked at writing a second edition, I knew that this chapter would need the most work. One thing which I say to every business owner that is sat in front of me as a client, or as an audience member at one of my talks is social media will not fix a broken business. If you don’t have the framework in place, to allow social media to become a piece to your business puzzle, it won’t make the perfect picture. Whilst the focus of this chapter is still the same, the content is completely different. I will share with you the latest features inside of the main social networks and how you can use Google and SEO to your advantage. I also go into great detail about the importance of digital marketing and how you can use email marketing, blogging, content marketing to promote your business online. I won’t give away too much about chapter four, but I will say that if you did purchase a copy of the first edition, you will be surprised to know that this chapter has more than doubled in size. Since launching my online training platform; ThinkDigitalFirst.com, I’ve been testing out a number of new tools which have helped me and my team not only to work collaboratively, but to stay focused on the tasks at hand. The tools that I mention in this book are here to help you grow a business, whether that’s locally, nationally or internationally. Some of the tools mentioned in the original copy of Think #Digital First are no longer around, or have been outperformed by alternative tools taking the market by storm. This chapter, for me, is about bringing everything together to convert visitors into prospects and prospects into happy customers who become 24/7 brand advocates. Having sold 1000’s of copies of the first edition of this book, I decided to reach out to the readers and gather feedback, to really help me design a strategy based on where you are in your business right now, and how social media and digital marketing can truly work for you. So based on the feedback I received, I’ve decided to break this chapter into three sections; preparation, getting started and growth. Throughout this chapter, I talk about the best ways to increase customer retention, and why I feel that building your personal brand is an important part of building a successful business. Over the last three years my personal focus has been on building my personal brand. When I wrote the final chapter of this book for the first edition, I focused on the importance of technology and using this to achieve your customer retention outcome. Now, rewriting this book and especially this chapter, I reached out to my peers and customers within the industry and got feedback from them on the one thing that made them keep on wanting to work with me. Unanimously, they said it’s because of how I’ve grown my personal brand online, and how I utilise customer loyalty and brand advocates who will happily go and talk about my business to their community. Get your ticket for the book launch on the 12th September below! I would love for you to come and join me at my book launch for the second edition of Think #Digital First. I remember sitting down in 2014, and writing the first edition of my book; Think #Digital First, hoping that it would be a success. I could never have imagined that I would be writing this, talking about writing a second edition. There are four options for you to join us and each is designed for you to get the most out of the exclusive book launch and continue your knowledge of social media and digital marketing. 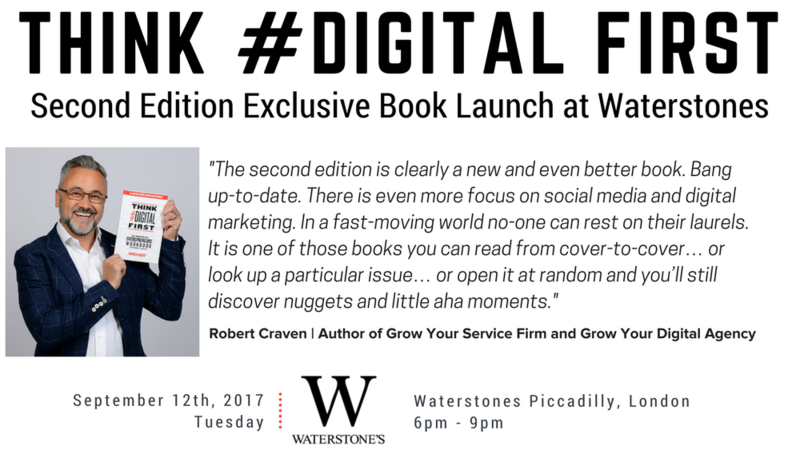 Come down to the book launch, spend the evening with Warren with the opportunity to purchase a signed copy of Think #Digital First; the second edition. Get a signed copy of Think #Digital First + nibbles, bubbly and a special gift bag. This will get you everything from option 2, and one Think Digital First online video course of your choice. This will get you everything from the option 3, PLUS a 30-minute digital marketing strategy session with me.